CCP Games, the world’s leading independent massively multiplayer game developer, has announced live streaming options for its annual fan celebration EVE Fanfest (May 1-3). Each year, thousands of EVE Online, DUST 514, and now EVE: Valkyrie players from around the world travel to CCP’s headquarters in Reykjavik, Iceland for three days of celebration of the EVE universe. CCP will be live streaming the tenth EVE Fanfest in standard definition for free on their Twitch.TV channel (http://twitch.tv/ccp/) and in high definition for a one-time fee of $19.95 USD or one PLEX (which can be obtained on the EVE Online in-game market). Viewers will get the latest announcements from CCP through broadcasted panels, presentations, PvP tournament coverage, the “Make EVE Real” science lectures, and the famous Party at the Top of the World amongst other unannounced events. All programming is highly produced and includes commentary and interviews from developers and players in the true EVE community spirit. 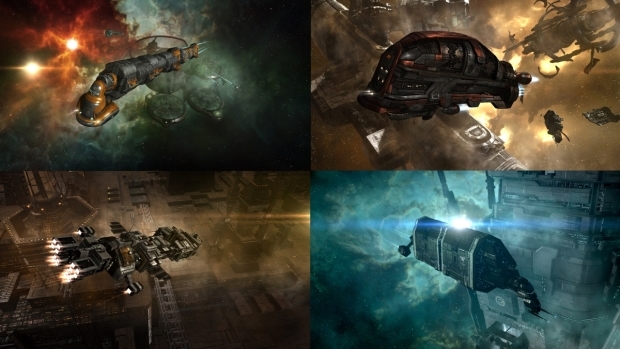 A choice of one of four unique industry ship skins for EVE Online: the Inner Zone Shipping Iteron (Gallente), Tash-Murkon Bestower (Amarr), Nefantar Mammoth (Minmatar) or Wiyrkomi Tayra (Caldari). While the HD stream can be purchased through CCP or Twitch.TV, only viewers purchasing the stream through CCP’s EVE Online account management system at https://secure.eveonline.com/fanfest/stream.aspx will receive the in-game promo items. This year CCP will be celebrating the 10th Fanfest as all three game experiences in the EVE Universe come together amidst countless player conversations, celebrations and parties. The night before Fanfest officially begins, CCP will be unveiling a monument donated to the City of Reykjavik in honor of all players and developers who contributed to the EVE Online universe during its first decade. Throughout Fanfest the development teams will also reveal some of their plans for the near future of the EVE universe as well as demo several first-time hands-on experiences.